Working out at the weekend can feel like a real chore. In fact, many of us give up on our exercise regime come the weekend – excusing ourselves from hitting the gym or heading out for a run because we have too many other things to do. But with the cold and flu season upon us, it’s more important than ever to keep to our fitness and healthy eating goals if we want to keep our immune systems boosted. So if you’re considering making an excuse to ditch your exercise goals this weekend, then think again. Here Anita Albrecht, a nutrition advisor and personal trainer, reveals her 30-minute weekend workout that promises to fit in with your weekend plans and keep you on target for your fitness goals. The perfect 30-minute weekend workout: A toning, aerobic fitness and strength exercise. The combination of skipping, mixed in with the resistance excises keeps your heart rate up - which if done with little to no rest period - gives you a real calorie burn and metabolic boost. Equipment you'll need: A skipping rope and a resistance band, with handles. 3-5 minutes skipping (work up to doing 5 minutes once you get used to it). 1. Resistance Band Rows: Great exercise for the back and arms. Loop your resistance band around a strong door handle or stair banister holding on to the handles at chest height. Pull the handles towards you squeezing your shoulder blades together and then release again. Make sure you have plenty of tension on the resistance band so you can really feel the tension as you pull the band towards your body on the contraction phase. 2. Squat with Bicep Curl: Place the middle of the resistance band under your feet holding on to the handles. Do a squat with your feet shoulder width apart keeping your abs pulled in tight, chest up and neutral spine with eyeline ahead (your weight should be in your heels). The depth of the squat should be where the thighs are parallel with the floor or ground, if you can. Once you have done the squat keep your elbows close to your ribcage and do a bicep curl with plenty of tension on the band. Perform this combination for 12-15 repetitions. 3. Chest Press: Just like you looped the resistance band around a banister, but this time your back is facing the banister. Step forward so there is plenty of resistance on the band and start with bent elbows at shoulder height creating a 90-degree angle. Push your arms forward now squeezing your chest muscles and straightening the arms out in front of you completely then release back to the start position. 4. Skip for three minutes. A great one for legs and bums! Stand with one leg in front and the other behind. As you bend down into a lunge bending both knees (the back knee should be just off the floor) keep your hips facing forward, abs tight and weight in the heel of the front foot. Reach towards the floor either side of your front foot keeping a nice straight spine touch the floor then lift up the upper body keeping abs tight still then reach and stretch up with both arms up towards the ceiling keeping your legs in a lunge position. 6. Tricep Press Up: Do this from your knees to start with. Straighten out the body keeping abs tight, neck in line with your spine and bottom down without collapsing the lower back. Your hands should be together, thumbs touching. Perform a 'tricep' push up but unlike a conventional press up, your elbows will be travelling in towards your ribcage then push back up again. 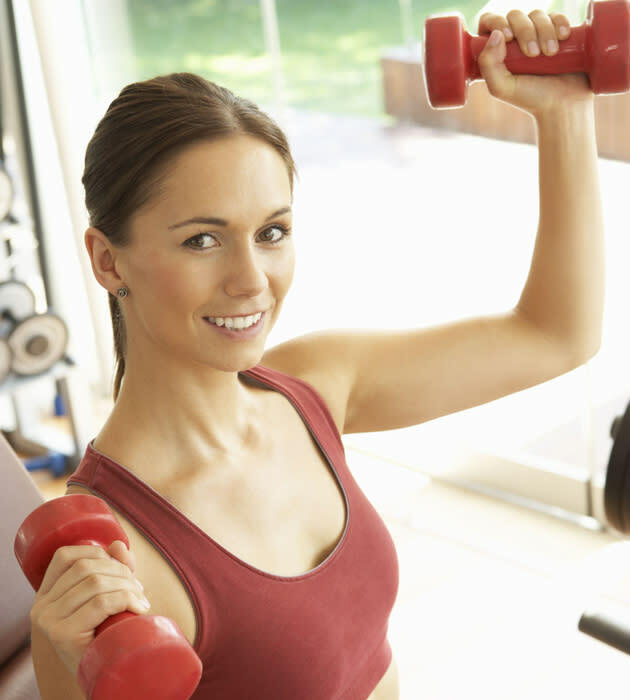 This puts the full focus on to your triceps toning those bingo wings. 7. Bicycles and Plank: Lie on your back and extend one leg out leg straight about 4-5 inches off the floor, with the other bent up towards your chest. Your hands should be at the sides of your head elbows bent. Lift up your upper body touching the opposite elbow to opposite knee then swap, but as you swap the extended legs and elbows bend as they comes towards your chest. Meanwhile the other bent leg extends out straight as it swaps keeping your upper body up, relaxing the neck muscles putting the tension on the abdominals. Once you have done 15-20 of these on either side, go straight into a front isometric plank holding it for as long as you can. A 'plank' is where you are facing the floor or ground, up on to the balls of your feet, neutral spine, pull your belly button into your lower spine leaning on forearms and keeping the body pulled in as tight as you can for as long as you can. Great core exercise and tummy combo putting these two together. A strong plank hold is around 2 minutes...see how long you can hold yours for. Finish with three minutes of skipping. Tell us how you got on over on Twitter, now.